Freebs! How is the #Shelftember Shelf Cooking challenge coming?? We are head-first into the first full week, and so far y'all have been EXPLODING MY BRAIN on social media! The meals you are making, the creativity I'm seeing, it's incredible. 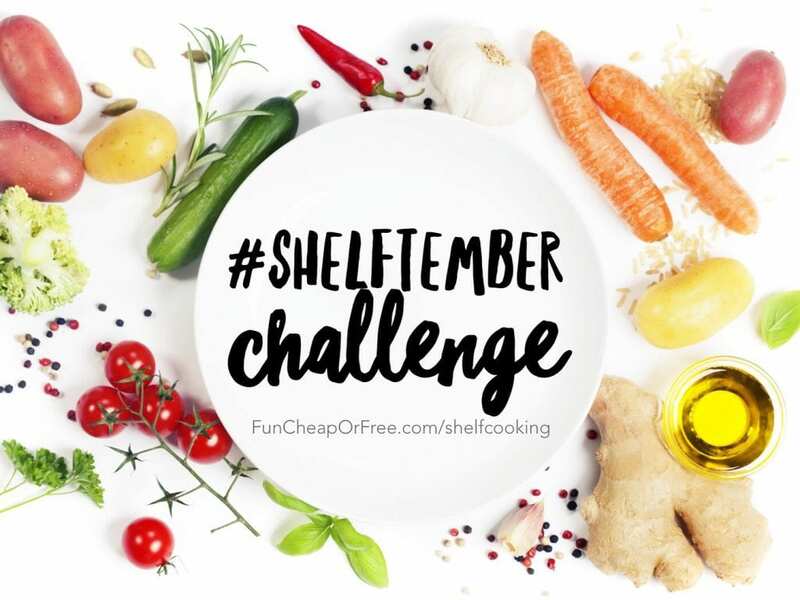 If you have no clue what I'm talking about, see all about Shelf Cooking and the #Shelftember challenge HERE (and learn about the freezer I'm giving away! ), then check out the hashtag on social media for major inspo. Now, onto the meat and potatoes of the day. Boy, are leftovers the Great Debate or what?? There are some households who refuse to eat leftovers. Some who will pretty much only eat leftovers. And some in the middle that are fine with them as long as they taste amazing, but usually end up throwing them out. So many people get sick of eating the same thing for days on end, or they are convinced that food just doesn't taste good after it's been sitting in the fridge or freezer. Want me to let you in on a little secret? That's true, actually. Leftovers are gross. UNLESS YOU DO LEFTOVERS RIGHT, that is! Today I'm going to share with you some quick leftovers tips to help you utilize the to their fullest. 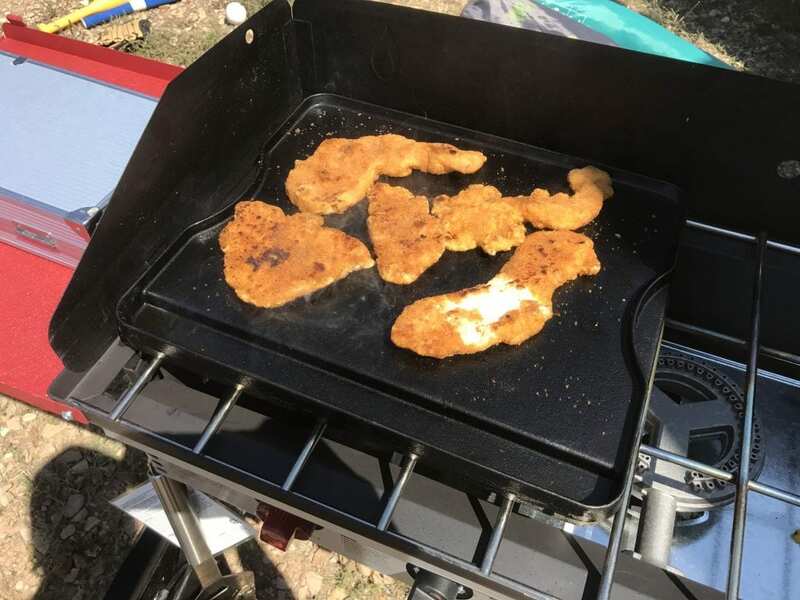 Tip #1: Heat it like you mean it. If you asked my husband for a weird quirk about me (and boy, I have many), I bet you $10 he'd say it's how OCD I am about the temperature of my food and drinks. If hot food isn't scaldyourmouthout hot, and cold food/drinks aren't hurtyourteethbashyourhead cold, I'm not interested and will complain. Greatly. So if even I with all my (lovely, unique, amazing, charming…wink wink…) quirks and love leftovers, so can you! Microwave first. Whether it's pizza, casserole, soup, veggies, etc. I like to heat it in the micro to get things moving, melting, and melding quickly. Ain't nobody got 15 minutes to wait for leftovers to heat properly on the stove when you're so hungry you are about to eat the toddler that's screaming at your left leg! …just me? Really though. If leftovers are taking you forever, you'll find yourself opting for convenience food instead. So learn to love your micro. Toast, broil and boil. 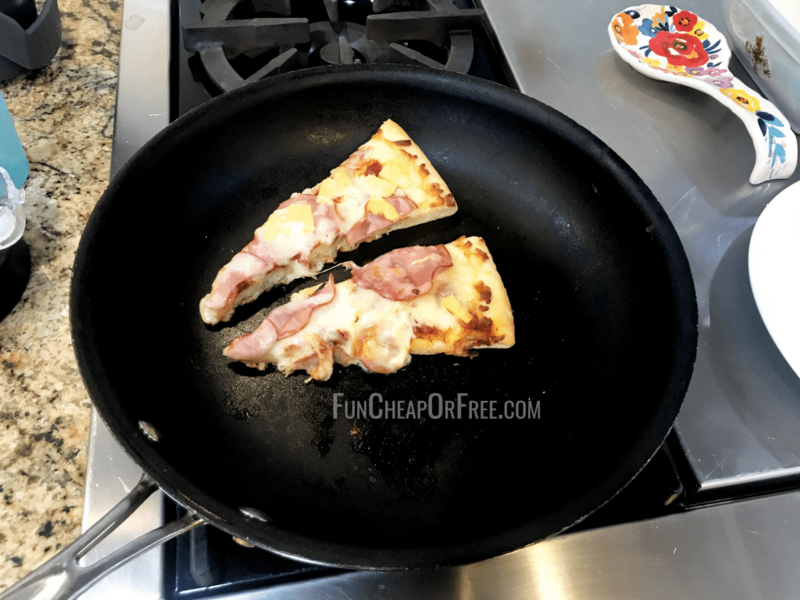 After microwaving it to heat it through, top it off for a few minutes in the toaster, on a pan on the stove, or under the oven broiler for a quick minute or two to top it off nicely. It adds a little crunch, browns the crust, stiffens the soggy, toasts the tush, whatever needs to be done. Magic happens with toasting, broiling, or boiling. Well, boiling was mostly tossed into this because I thought it sounded cool. So just use your imagination on this one. The other day we had leftover pizza. The cheese had become a bit gummy in the fridge, so we first microwaved it, then toasted BOTH SIDES (yes, crust side AND topping side) on a pan on the stove. Truth be told, this is actually how I make my grilled cheese and quesadillas too – I microwave first to melt the cheese, then toast on the stove for some crunch. Makes them in half the time. #YoureWelcome. …just take my word for it. Tip #2: Add seasonings, spice, or somethin' nice. Fresh lemon or lime, bottled lemon or lime juice, OR, crystalized lemon or lime. THIS STUFF IS MAGICAL. Red pepper flakes. Adds a little kick without making it too spicy. If you're heating up leftovers that are turning out dry…wet it up, baby! Dry mashed potatoes? Melt some butter and add a little milk. Dry rice? Add a tablespoon of water before reheating. Dry, crusty bread? Melt butter on it, dip it in soup, or you can even microwave it! Wrap the dried bread with a damp paper towel, nuke for 10 seconds (and then 10 seconds more if needed), and that should soften it right up. Salsa, sour cream, salad dressing, pasta sauce, oil/vinegar, Tabasco, Teriyaki sauce, soy sauce, butter, lime/lemon juice…if it seems dry, add some wet! 'nuff said. Tip #4: Top it off. Cheese! Toss some cheese on anything and it kicks it up a notch, especially when you broil it for a second in the oven. I'm obsessed with Queso Fresco (can be found at most grocery stores, but it looks like THIS) and add it to just about anything Mexican. Nuts. Sliced, slivered, candied, chopped, you name it, it's all good, especially on salads. Adding a little texture to leftovers can make all the difference. Trust me, Bubba is a texture FREAK and he's a leftovers fan…so it CAN be done, lol. Get creative with your leftovers! Loads of plain white rice? Make ham-fried rice, throw it in a soup, make Mexican rice, add it to meatballs or meatloaf, etc. Sick of that grilled chicken? Chop it up and make chicken salad sandwiches. Dice it for a soup. Add it to a casserole. Make burritos or enchiladas. Make a chicken stir fry. Make it saucy and put it over rice. Leftover hamburgers from a BBQ? Chop up the cooked patties and make hamburger soup, or cheeseburger casserole. Make mini sliders with different toppings so it feels and tastes different. Toss it on a salad! Enchiladas/tacos, make a taco salad. BBQ chicken salad. Cobb salad. Strawberry spinach salad. For real, you can take just about anything, put it on lettuce, and BOOM. Get the drift? Take what you have and just repurpose it! So there you go. Now you have no excuse for NOT eating leftovers. Again, keep your eye on my Instagram stories (if you have IG!) because it's a straight-up cooking show over there. I show what I'm eating and cooking each day, how I prepare it, and how I make it taste delicious to my ÜBER picky family. This is a great way to use up the food in the fridge! Ok, I have always had this weird quirk: I HATE the taste of heated-up leftover chicken. I think it has the weirdest, nastiest taste. I am good with pretty much anything else heated back up, except chicken. Anyone else? I wonder if nuking it gives it that weird flavor? Try it in a skillet or soup! It’s probably just getting overcooked in your microwave. My mom is the same way, she would rather eat leftover chicken cold than heated up. In general, I agree! Microwaved chickens just tastes strange, and is often rubbery. Heat it up (and let it brown a bit) in a skillet with butter or coconut oil and you’ll love it again, promise! Adding a little extra salt or spices also helps a lot! I love all these ideas… I have been joining along with #shelftember and I’m so impressed with myself so far – 7 days in and I haven’t rushed to the shops to get anything yet. And we are actually eating food from my fridge which would usually sit there for a week before I would throw it away! I’m lucky that my family is happyto eat left overs as I know there are others out there that aren’t. I think people think of leftovers as eating the same meal again, when it doesn’t have to be that way. You can simple use what you have left over as an ingredient of another meal. We are a family of 6 with big eaters so I don’t usually have a lot of leftovers. But if I do try my best to make them into something else completely so nobody really knows they are left overs. Leftover creamy chicken pasta sauce – line a jumbo muffin tin with shortcrust pastry, add sauce as filling, top with puff pastry, seal the sides and cook them in the oven and you have chicken pies. Love my leftovers !! Great tips and ideas for those complaining about them😜Saves soo much money using up food you already have without letting anything go to waste! Always bring home the left over fries from any restaurant. the next morning, cut them up and fry them in a skillet and add eggs, green peppers, cheese…whatever is your favorite. Excellent omelet with hash browns!! I am the only one that enjoys certain types of leftovers. My daughter usually will eat any kind of meat, rice or pasta as leftovers. So for potatoes leftovers, I have to be creative. For leftover mashed potatoes, I make potato pancakes and serve them with sour cream or applesauce. For leftover salt potatoes, I make a frittata with onions, peppers, eggs, sausage, pepperoni and the salt potatoes. It is devine. My grandparents taught me this and now I sometimes do it too: at the end of the week, make Stop It Stew: combine all leftovers in a pot, add some slices abs broth or diced tomatoes etc, summer until heated through. You can add rice to it or noddles too. My husband and I have taken leftovers for our lunches for our entire careers! Just make sure to dish it out before feeding the family or else there might not be leftovers 🙂 To eat out lunch would probably run us about $10 each. So we’ve saved about $50,000 over the course of our work years . . . dang, that quite a savings! Another tip for people who just can’t stand leftovers at all- make less food to begin with! 🙂 Seriously, almost any recipe can be halved or even fourthed. You will probably need to cook it in a smaller pan or dish to make it turn out the same. I.e. a tiny crockpot instead of a huge one, a 7 x 11 casserole dish instead of a 9 x 13, use a 2 quart pan instead of an 8 quart stock pot. soup at the end of the week.. My favorite thing that goes over well is leftover meat loaf to taco meat. I add Rotel, beans and taco seasoning. It seems like this always turns out better than when we actually make tacos! My family isn’t crazy about eating the same things twice in a week but this way they never know the difference! After watching your videos and reading this post, I have fallen in love with repurposing leftovers! I even find myself making recipes that I know will leave me with leftovers so I can find new ways to use them. It’s fun! 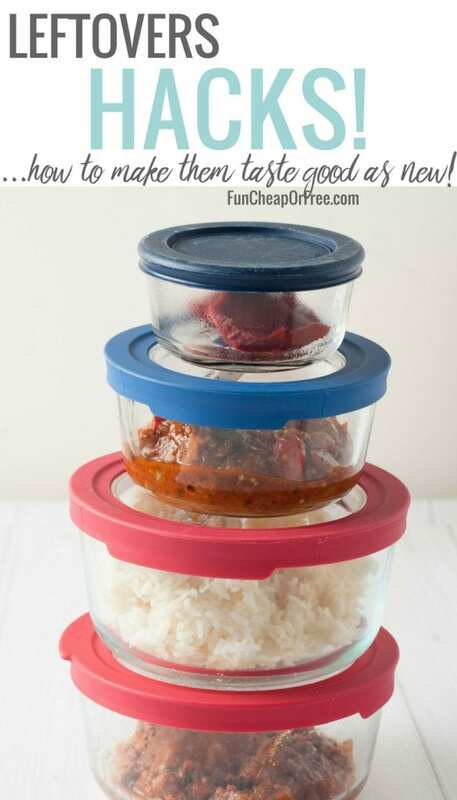 I love these tips…I am typically the only person to eat left overs (my husband simply just doesn’t care for them)….but if I repurpose them I think it’s safe to say it would be a game changer. This is awesome! Using the microwave and still having yummy food is great. Love these tips! Already was doing some of them, but so many more have been helpful! Especially the grilled cheese tip! Great ideas!! We love leftovers at our house. I hadn’t thought of some of these before! Thanks!! I’m feeling more motivated to use our leftovers more often. Do you do leftover pasta? I find it always gets gummy unless it’s something like lasagna. I wish I had learned this microwave/ then broil trick a long time ago. You’ve changed my life! No more soggy leftovers. Since seeing this post I have tried broiling and repurposing leftovers, and both were a success! Makes such a difference! Thank you! These tips are actually amazing. I have leftovers for lunch like 4 or 5 times a week, so I’m really excited to try some of these! 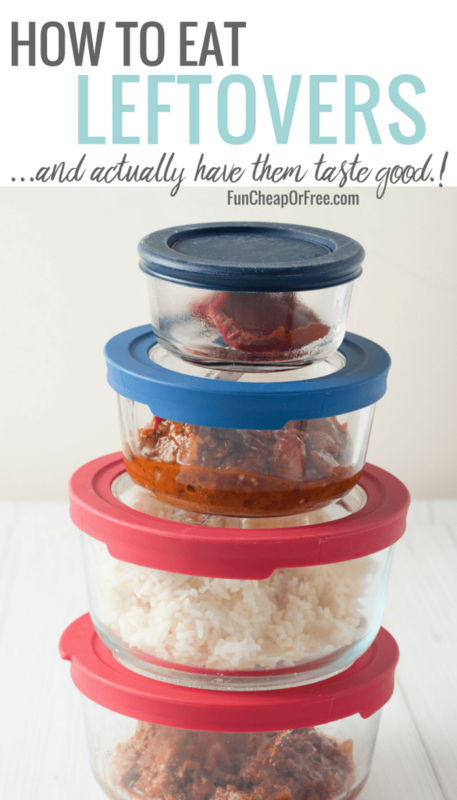 My husband has always hated leftovers and now he’s made me cringe over them too! We don’t have a microwave so that makes it tricky for quick leftovers. I’m going to try this! I love your idea of throwing any and everything over a salad! Great tips!! Most people don’t like leftovers but it’s because they don’t know how to eat them correctly!! Great tips! 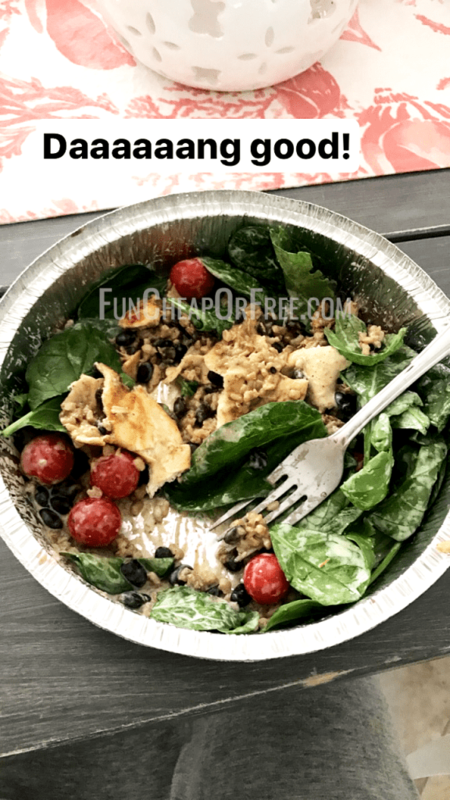 getting leftovers to taste good can be a challenge, but if I can get my boys to eat more leftovers that would save us a ton of money! I never have thought to mircrowave the dang quesadilla first. What a great idea idea!! Love these ideas! I did a turkey pot pie all from food given to us over the holidays (canned items etc) then given turkey. It was honestly THE best as far as leftovers go! I love these tips.. use the often. My husband always wonders why I micro and then oven and season. It makes it like a whole new meal! These tips are so smart! My husband hates leftovers, so this will help us. I always just use the microwave leftovers, never even thought of putting in the oven again or on the stove to reheat. I love this post!! Such good tips. We eat lots of leftovers, but we can still up our game big time in how we prepare them. Thank you!! So hard to eat leftovers sometimes, but I’m definitely giving it a shot! I need to try these tips! Getting my husband to eat leftovers is like pulling teeth! This makes using leftovers sound so much better. I like the grilled cheese & quesadilla microwave/grill hack.